Xenical is a prescription only slimming aid to help people who are struggling to lose weight. Xenical (Orlistat) is a lipase inhibitor and therefore works with your digestive system to filter out fats consumed in your daily diet. As our bodies require fats to function, your body will tap into your fat reserves and Xenical (Orlistat) should therefore aid fat metabolisation, leading to a reduction in your overall body weight. Xenical is a prescription medication so you must complete a consultation form before you can buy Xenical online. Consultations are entirely free and you are under no obligation to make a purchase. 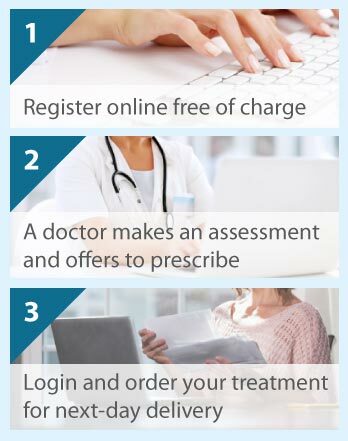 You do NOT require an existing prescription to get Xenical from The Online Clinic as we are licensed to issue prescriptions after an online consultation. People normally notice that their clothes are fitting a bit better when they start taking Xenical before they notice much difference on the scales. It is important not to expect miracles with Xenical or any other weight loss medication but for those who persevere beyond the first month and follow the recommendation to keep dietary fat below 30% of calories in any given meal, results should be achieved. Clinical trials have demonstrated that when two groups of people on the same mildly hypo-calorific diet were compared, over a 12 month period the group on Xenical managed to lose around twice as much weight as those on the diet alone. We often hear from people that they do not think that Xenical is appropriate for them as they do not eat a lot of fat. It is a prerequisite to taking Xenical that the patient has a mildly low fat diet. Patients who consume large quantities of fat while on Xenical will experience unfortunate side effects which is why we insist on a mildly low fat diet where no more than 30% of calories come from fat in any given meal. Because Xenical interferes with your body's absorption of some fat-soluble vitamins, you should take a daily multivitamin supplement that contains vitamins A, D, E and K and beta carotene once a day at least 2 hours before or after taking Xenical. Xenical is a prescription medication so it is not appropriate for everyone. It is essential that you answer all the questions on our consultation form correctly and disclose any pre-existing medical condition so that we can make a correct diagnosis and treatment recommendation. We are on hand to answer any questions that you might have about Xenical. What are the side effects of Xenical (Orlistat)? As with all medications, Xenical has some potential side effects but as the drug acts locally rather than centrally, the extent of the potential side effects is limited. The most common side effects, which tend to be gastrointestinal in origin, can normally be controlled with a small adjustment to your diet as outlined above. If you have any concerns about taking Xenical, please do not hesitate to contact us or discuss the matter with your GP. A full list of potential side effects are listed in the pre-purchase guidance which is available if we approve you for Xenical. You can read more about Xenical side effects here. A full price list is available after you register and there are discounts available on Xenical multipacks. Our prices include the private prescription and guaranteed next day delivery in the UK. If you require your item to be sent overseas then there is a small courier charge. We offer a price match if you see an identical service cheaper elsewhere.